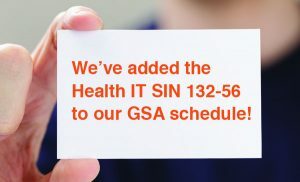 We are excited to announce the addition of the Health IT SIN 132-56 to Sparksoft’s existing GSA IT Schedule 70 (GS-35F-161CA)! The GSA’s IT Schedule 70 is the largest, most widely used acquisition vehicle in the federal government. It provides direct access to products, services and solutions from more than 5,000 certified industry partners. The Health IT SIN 132-56 was developed by the GSA to assist federal customer agencies in finding IT expertise that meets their highly specialized requirements. This new SIN will pull together offerings from across the health IT spectrum including connected health, electronic health records, health information exchanges, health analytics, personal health information management, innovative Health IT solutions, health informatics, emerging Health IT research, and other Health IT services. This addition of the Health IT SIN sets us apart from other IT service providers, assuring our customers that we are dedicated to the unique needs of Health IT. It also makes us accessible to more customers and agencies, expanding the reach of our services. This is an exciting addition to the Sparksoft portfolio of credentials, and we thank you for your continued support as we reach more milestones! See our full list of Certification and Contract Vehicles here.